by Samuel D. Gruber / all photos courtesy of and copyright Tod Bryant and Historical Perspectives, Inc. 2012. Temple Beth Israel in Danielson, Connecticut, a modern synagogue building erected in two stages in the 1950s and early 1960s, has been listed on the National Register of Historic places for its historical and architectural value. 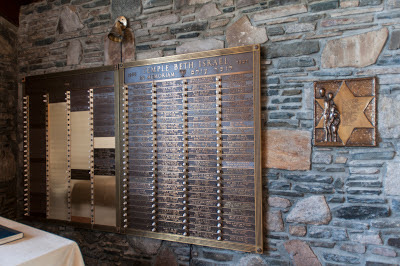 Research on the building was sponsored by the Temple Beth Israel preservation Society and carried out by Julie Abell Horn of Historical Perspectives who wrote the NR nomination. You can read the full nomination report and see more pictures here. 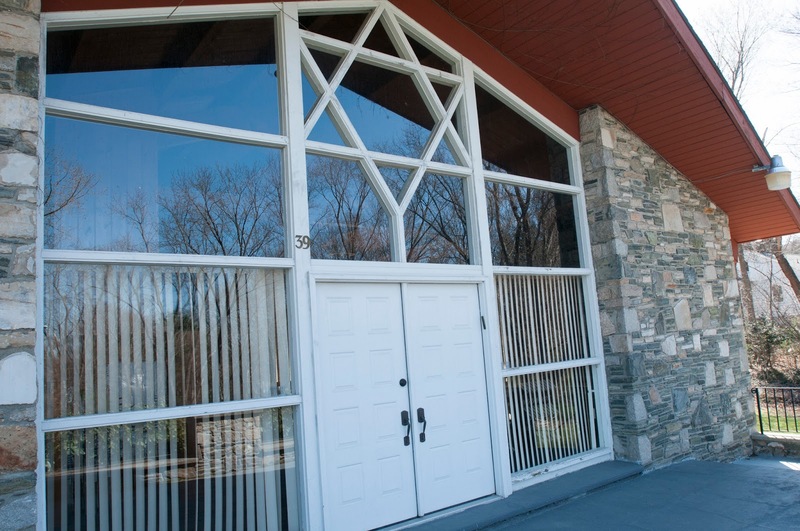 The modest-sized (40' x 70') rectangular field stone and wood-faced synagogue was erected by a the combined community of 1920s Jewish settlers to the mostly farming community and a larger influx of Holocaust survivors who settled in the area after World War II. Prior to the war the town's Jewish community consisted of nine families, who had worshiped in private homes, but after the war the Jewish Agricultural Society helped resettle forty Jewish families, mostly Holocaust survivors, in the area. Although they had limited resources, this larger community community decided to erect a purpose-built synagogue. The history of the effort to raise funds and decide ritual and design issues is narrated on the Temple website and in the NR designation report. 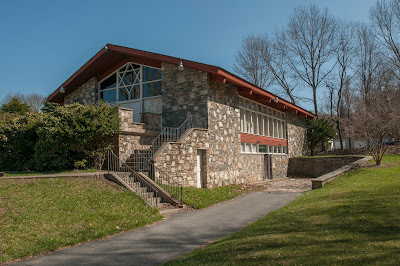 The lower portion was completed in 1951 after designs by architect William Riseman (1911-1982). Riseman studied at Yale, but was influenced by the new modernism taught especially at the Harvard Graduate school of Design led by Walter Gropius. The upper section and interior were completed by Maurice N. Finegold (b. 1932) in 1961. This was the first religious project for Finegold, who has gone on to be a prolific and significant design of synagogues and churches. 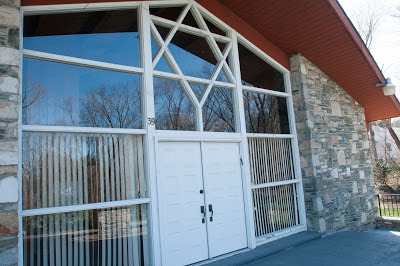 Except for a large Magen David used as window tracery over the main entrance, there is no overt indication that this is either a specifically Jewish building, or even one designed for religious use. Nestled into a small hillside and set onto a landscaped lot in a residential neighborhood the stone faced building looks new, but pays homage to the older local vernacular tradition of farmhouses, storehouses and barns that dot the Connecticut countryside. One thinks, for instance of the 17th-century Henry Whitfield House in Guilford, not far from New Haven. It also probably reflects awareness of the recent houses designed and built by Harvard's Marcel Breuer. The synagogue is thus interesting mix of vernacular traditionalism and up-to-date modernism. According to Julie Abell Horn, Temple Beth Israel was importantly an early instance of the congregation wanting to explicitly commemorate the suffering and lose of the Holocaust - felt so immediately by the survivor population - and yet the congregation was unable to agree on a strong artistic or architectural commemoration element for the building. In the end, the vestibule before the sanctuary was designated a memorial area and remembrance plaques were included, but these are hardly specific about the Holocaust, and the entire lack of a strong commemorative statement is very much in line with America's overall inability in the 1950s to publicly accept and forcefully discuss - let alone represent - the horrors of the Holocaust. 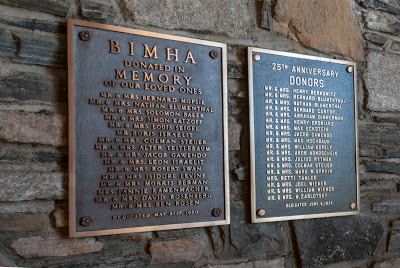 It is a telling coincidence that the sanctuary was designed in the same year as the Eichmann trial in Israel, a pivotal moment when Israel, America (and other countries) focused on Nazi crimes and Jewish suffering. 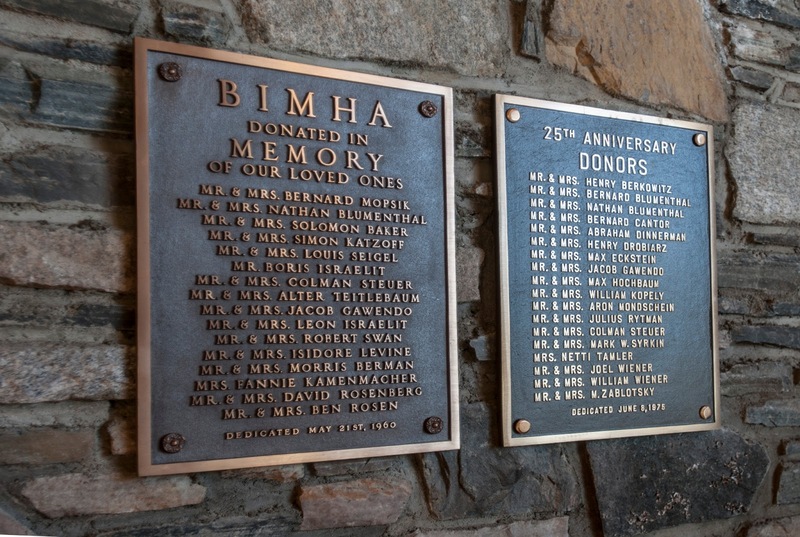 Of course, in the case of Temple Beth Israel as opposed to many more typical post-war suburban synagogue communities, it was the congregation itself that was the memorial body, since the dozens of survivors would always remember their perished loved ones and home communities, for whom they would regularly recite Kaddish. In a sense, the entire synagogue is both a monument of memory and also a strong affirmation of Jewish survival. 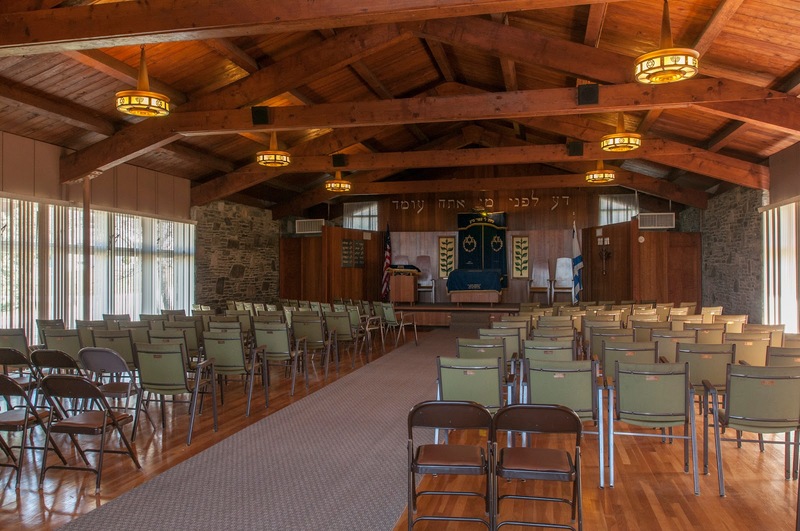 We know in a least one other case of a survivor built synagogue, that of Beth Hebrew in Phoenix, Arizona, that the congregation preferred a simple modern structure rather than any type of building that resonated with historical associations. The newness of design and construction could, it seems, be a soothing environment for both reflection - but also renewal. Both architects - Riseman and later Finegold - were Jewish, but raised and educated in America. it is unknown how much of much they were able to understand, absorb and reflect of the congregation's Holocaust history. Riseman's mother Mary was, however, a member of the congregation (the family were poultry farmers), so there was a close bond between client and architect. Riseman had graduated from Yale as a painter in 1933 and then worked as an interior designer, creating in 1936 William Riseman Associates which expanded in the 1940s into theater renovation work. According to Julie Horn he "was moved by the plight of the congregation's Holocaust survivors and wanted to make a contribution on their behalf. took an interest in the project and agreed to donate his services to design the building, and his mother Mary offered free field stone form the quarry on the family farm in Brooklyn [Conn.] to be used in the construction." 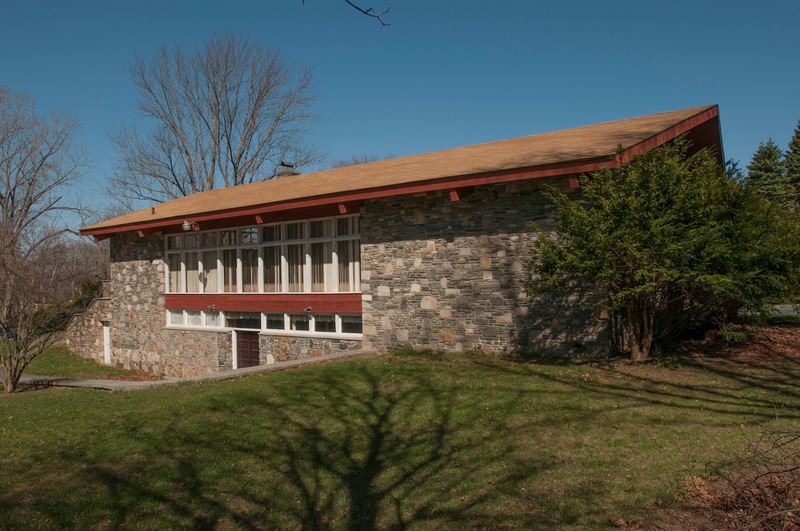 (How different from Nazi-sympathizer Philip Johnson's self-serving donation of design services to Congregation Kneses Tifereth Israel in Port Chester, NY around the same time). The Beth Israel sanctuary was begun by Riseman and the shell of the space was completed in 1955. Riseman then recommended synagogue architect Isador Richmond to complete it, and Richmond then referred the congregation to his son-in-law Maurice N. Finegold who was jut receiving his architecture degree form Harvard and was looking for work. Finegold's project is a simple almost rustic space. The open-raftered ceiling with exposed beams and the wood paneling reminds me of the simple wooden synagogues of the Catskills and Adirondacks (such as in Tupper Lake), built for an earlier generation if immigrants. One thinks, too, of all those large similarly open - though less substantial - recreation and dining halls at Jewish (and other) summer camps. Perhaps too, there is a faint influence of the Polish wooden synagogues which became well-known in America after the 1959 publication of the English edition of Wooden Synagogues by Kazimierz and Maria Piechotka. I've previously written about the influence of this book in my essay on Polish Influence on American Synagogue Architecture. It is good to see modern synagogues gettign recognition, and to learn when congregations take the initiative to document their history and protect and preserve their design and even better to see synagogues still in use by the congregations for which they were built. Mazel Tov to Temple Beth Israel and their National Register designation!